The Kubikiribōchō is a massive broadsword shaped like a giant butcher knife, earning it the title of "seversword". Like the other weapons belonging to the Seven Ninja Swordsmen of the Mist, the sword is passed down from generation to generation amongst the group's members. Like the other weapons employed by the Seven Ninja Swordsmen of the Mist, the sword possesses a unique power, this being its ability to reform itself using the iron harvested from the blood of its victims. This regenerative process takes place almost instantaneously and is capable of bringing the weapon back to its original condition no matter how severe the damage is, from a simple chip or nick to a complete separation of over half the blade. Samehada is a large sentient sword, comparable in size to the Kubikiribōchō. It is described as "the most terrifying of all the Seven Swordsmen's blades" and even earned the title of "greatsword", further adding to its fearsome reputation. As the blade is made up of scales, it inflicts injuries through shredding or shaving what it comes into contact with, rather than just cutting the object in question. This flaying effect is similar to a shark's skin, hence the sword's name. While it ordinarily remains rigid, Samehada's hilt is able to stretch and bend to great extent, allowing the weapon to be used like a flail. Samehada shares a symbiotic relationship with its wielder, similar to that of the kikaichū. 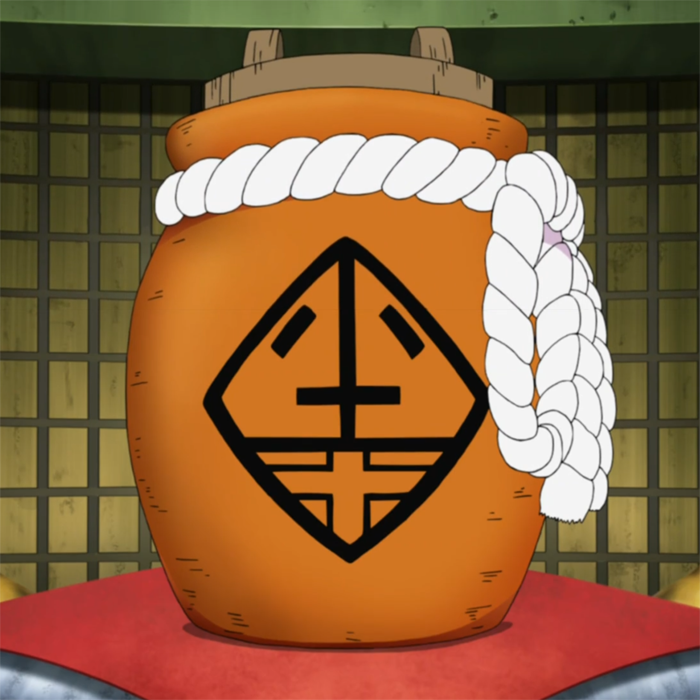 Although it continually consumes the chakra of its owner, its largest meals come from fights, wherein it absorbs the chakra of the opposition instead. Such an ability allows Samehada to literally slice through an opponent's techniques, in spite of whether the chakra has been transformed or not, and even prevent them from being performed by absorbing all of the necessary chakra, before preparations can be completed. This is particularly useful when fighting jinchūriki, as Samehada can quickly deplete their large chakra supplies as well as remove their chakra cloaks, illustrated when Killer B was reduced back to Version 1 after initially being in Version 2. However, it seems to be unable to automatically absorb ambient chakra, as in all instances where it has absorbed chakra are when either the opponent had a visible aura around them or when direct physical contact had already been established. Due to its voracious appetite, Samehada is drawn to those with large chakra supplies, allowing it to be used as a quasi-sensor. While the ability to absorb chakra is useful in defeating opponents, it is also beneficial to the user as well. Samehada has the ability to transfer the chakra it has absorbed to the wielder by partially fusing with them, so it can be used to either regenerate injuries or replenish their chakra reserves. This makes the user of this sword extremely difficult to defeat, however, a wielder such as Kisame can take this fusion one step further, by completely merging with Samehada. Doing so causes him to become much more shark-like in appearance, growing fins and webbed hands that allow him to move through water with considerable ease. Kisame also receives some of Samehada's abilities while in this form, such as being able to extend spikes from his body for offense, and absorbing chakra when others come into direct contact with him, as well as the ability to track chakra. The Nuibari is one of the swords of the Seven Swordsmen of the Mist, wielded by Kushimaru Kuriarare. The blade itself assumes the form of a narrow "longsword" that greatly resembles a large needle, with a long length of thin wire mirroring thread, tied to the eye located at the base of its hilt. This sword is said to possess the ability to pierce all and stitch them together, demonstrated through its ability to effortlessly penetrate multiple targets in a single thrust and then quite literally stitches them together in substantial bundles, by simply pulling the attached wire taught. A capable user can even throw the sword with the intent of piercing a line of multiple enemies, before catching the needle at the other side and repeating the process at different angles, in order to create knots of corpses with the wire passing through the entirety, effectively creating bundles of bodies at various points along the length of the thread. The Kabutowari is one of the swords of the Seven Ninja Swordsmen of the Mist, wielded by Jinin Akebino. The sword itself consists of a giant axe and hammer, linked end-to-end by a flat thin leather-like rope, which together are referred to as a "bluntsword" that is said to be able to break through any defence. Although the length of cord means each weapon can be utilized individually, to cut and crush obstructions respectively, their true strength lies in their capability to be employed in conjunction with one another. When facing a particularly difficult or seemingly impenetrable defence; the wielder can first attack by striking with the axe, before slamming the hammer downwards onto its blunt backside, thus using the blade like a wedge to drive straight through the offending obstacle and into the desired target located behind. Shibuki is one of the swords of the Seven Swordsmen of the Mist, wielded by Jinpachi Munashi. The blade utilises various explosive tags, contained within a substantial scroll, in order to incorporate explosions into the user's own swordsmanship, earning it the title of "blastsword". The sword itself features two distinct sides, with a narrow cutting edge located down the entirety of one length and a wide platform section on the other. The aforementioned scroll unrolls along this latter side, sliding downwards and resting atop its surface to form an individual segment comprised from numerous explosive tags, which separates from the remainder upon detonation. Only once the desired opponent comes into contact with the platform, do the explosive tags finally ignite and then detach, providing a small opportunity for the user to escape the devastating blast radius, while simultaneously compensating for any resultant recoil. The sword is seemingly able to reload another segment of tags onto the platform, automatically after each strike. Kiba is a set of twin swords of the Seven Swordsmen of the Mist. They each have been imbued with lightning, displaying enhanced cutting power in a manner similar to the high-frequency vibrations of lightning-based chakra flow. It is this capability that has resulted in these "thunderswords" being claimed as the sharpest swords in existence. Innate: Increases weilders thunder style jutsu attack by 25% of jutsu Str.. According to Suigetsu, this is the only sword still in Kirigakure's possession out of the original seven blades, by the time of the Fourth Shinobi World War. Suigetsu also noted that his brother Mangetsu mastered the use of this sword in the past and is most likely its former wielder. The weapon itself features an enormous wide and flat blade with two indentations near its base, creating a sort of guard, and two handles connected to each other by a short length of cord, earning it the title of "twinsword". The overall sword looks like a flounder fish in shape and is also apparently very heavy, as Chōjūrō tires easily when carrying it for extended periods of time. When unleashed, it emits chakra from the holes found at the top which coats the entire blade. The sword itself is capable of storing chakra and the two holes at the tip of the blade emit it on command. This can then be formed into various weapons, including a hammer or a longer sword. 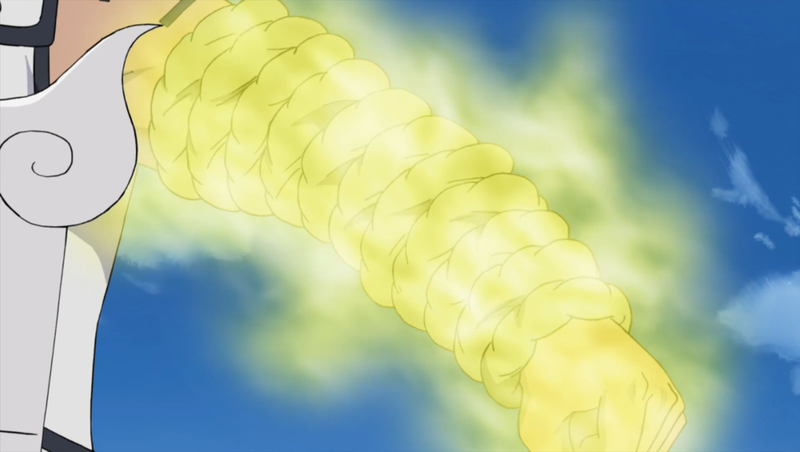 The size of the resulting weapon appears to depend upon the amount of chakra stored up beforehand, meaning a larger quantity will be met with a similar increase in the weapon's ultimate size. These weapons are also formed with notable speed. Innate: Able to restore 20% of weilders total Sta once per battle.. The Bashōsen is a large fan that is able to generate all five of the basic elemental chakra natures. To do so, the user need only say a mental command, which produces substantial amounts of the desired element when the fan is waved. The Benihisago is a giant brown-coloured gourd with a red cloth around it. It is able to take a person's word soul hostage by saying the verbal command "record". After the word soul has been drawn out by the Kōkinjō and then severed from their body by the Shichiseiken, it is absorbed into the gourd. Completing these conditions "curses" the victim; if they utter the word they have said the most during their life, they will be sucked into and trapped within the Benihisago. Saying a homophone of their most frequently spoken word, or even saying nothing at all for a certain amount of time, will also trigger the gourd's suction. If a victim starts to be sucked into Benihisago, the suction will stop if their most-used word changes. The Kohaku no Jōhei is a large pot that had the ability to seal anyone within it, if the target responds when called by the wielder of the pot. If the person responds, the pot records their voice and then seals them. This function is similar to the Benihisago, but more advanced as less preparation is required. The pot has a stylised kanji for "lightning" on it and a thick rope tied around its rim. In the anime, it is filled with a dark liquid. The person that is sealed into the pot seemingly merges with the liquid. The Kōkinjō is a thick length of rope. By saying the verbal command "Bind and Draw Out" it is able to draw out the word soul of anyone the rope has come into contact with, allowing it to then be severed by the Shichiseiken. The command is not mandatory. The Kōkinjō will not draw out the word soul of its wielder. The item generates an aura that can take the form of additional ropes, giving it a greater range. The Shichiseiken is a light blue broad and flat sword with a brown talisman hanging from the bottom. By saying the verbal command "curse", it can be used to sever the word soul of those struck by the Kōkinjō, allowing the soul to be sucked into the Benihisago. Completing these conditions "curses" the victim; if they utter the word they have said the most during their life, they will be sucked into and trapped within the Benihisago. Whatever this word is will be inscribed onto the Shichiseiken's blade. The wielder can fold the blade to prevent the victim from seeing what it is. If their most-used word changes at any point, the inscribed word will be updated. 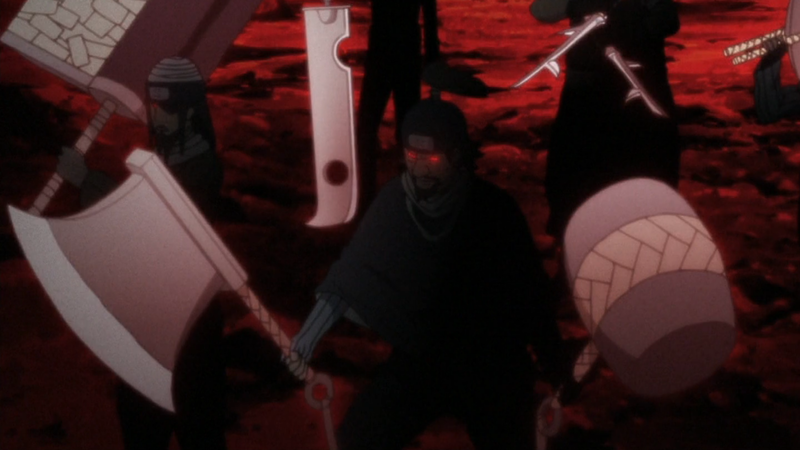 The Triple-Bladed Scythe is the primary weapon of Akatsuki-member Hidan. Its main purpose is to aid him in collecting blood for his curse ritual. Because of this, it is designed, not so much to kill the target, but to wound them, no matter how big or small the wound. The three blades get smaller from top to bottom, giving the scythe a larger range, despite decreasing its lethality. The scythe is attached to a long metal cable, wound around two spools on Hidan's left hip. This cable is strong enough to block kunai and allows Hidan to further increase the scythe's range by swinging it through the air. 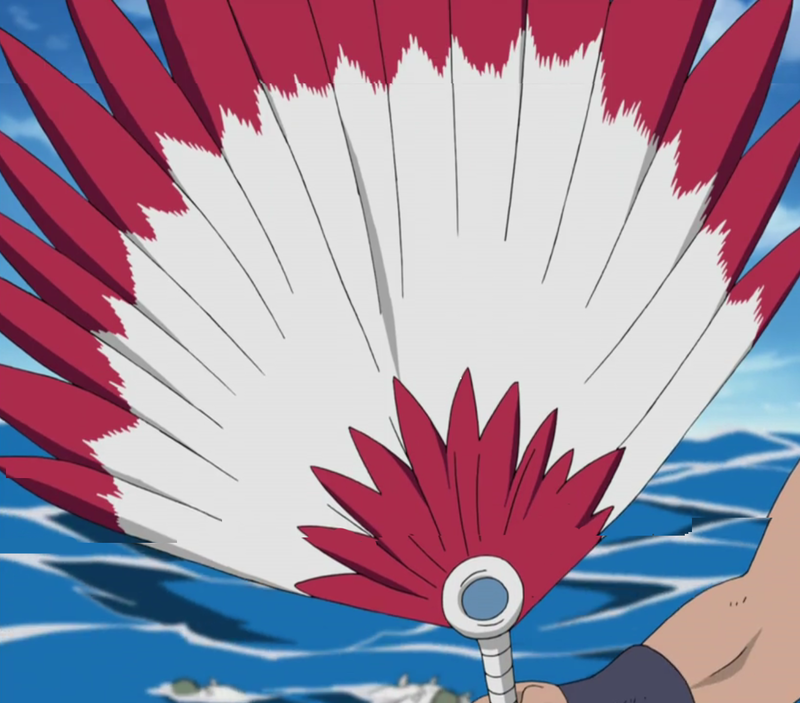 The retractable spear is a weapon used by Hidan mostly in his Jashin rituals. The spear is a retractable cylinder that can be extended to its full size quickly. It is regularly used as Hidan's main killing move during his ritual, by stabbing himself in the heart. Hidan's rituals are usually long due to him liking to toy with his opponent, such as stabbing himself in several different areas of his body, to make them suffer before finishing them off. It can also be used for combat, such as the desperate attempt to draw Shikamaru's blood, when his Triple-Bladed Scythe was lost. He is shown to hide at least two such spears in his Akatsuki cloak. A mask resembling the Shinigami's face, it resided on a wall inside the Uzumaki Clan's Mask Storage Temple located on the outskirts of Konohagakure, along with twenty-six other similar-looking masks. It allows the wearer to call forth the Shinigami by possessing the user. This allows the user to perform Dead Demon Consuming Seal: Release. Ability: Allows user to remove the souls sealed inside of the Reaper Death Seal shinigami.